Bhutan is a remote and tiny nation located between India and China in the Eastern Himalayas. The nation was so remote that the only way to access the country from the rest of the world was to travel from India on foot to the border town of Phuntsholing and from there by mule or horse into the interior of Bhutan. It was not until 1962, Bhutan printed country’s first stamp. 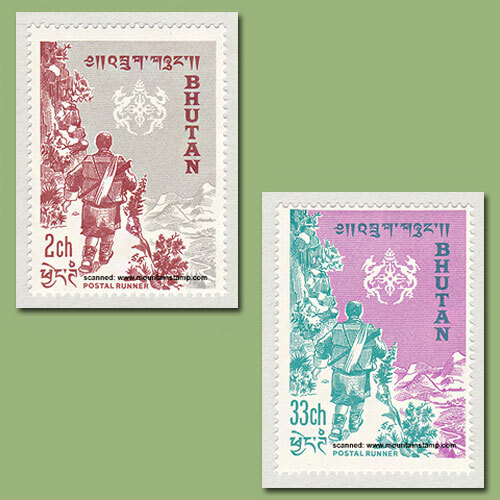 Two stamps were issued with the denomination of 2chhertum and 33chhertum (the currency of the Kingdom of Bhutan). The stamps come in two different colours. The 2ch stamp is in red and white colour and the 33ch stamp is in pink and green colour. Both the stamps depict the postal runner carrying a backpack full of letters with the beautiful landscape of Himalayan Mountains in the background. The name of the country appears both in Roman and the local script of Bhutan. The stamp also depicts royal coat of arms above the head of the postal runner.